Tullow Tennis Club was founded in 1950. One of the early founders was the late Brian Hanly of Tullow who put in a great deal of work in starting and running the club. 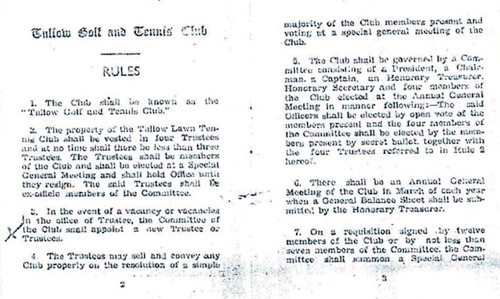 The club was officially called Tullow Golf and Tennis Club but generally known as “Tullow Tennis Club”. In the early years croquet was also played in the front of the club house on site. The original club house was built during the 1950’s but was derelict and now a new modern clubhouse has taken its place. The tennis club facilities consisted originally of just two grass courts and one tarmac court. In the 1980’s a second tarmac court was constructed. There was also of course a 9 hole pitch & putt club on site which was in use up to 1990 but along with the other facilities also ran into disuse. Tennis tournaments were a regular feature of the club over the years with competitions in particular between neighbouring towns of Rathville and Ardattin. 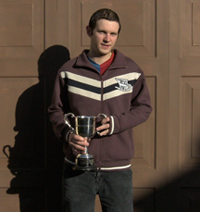 There were also several internal competitions held over the years with the Ladies and Mens perpetual trophies in particular played for each year up to the 1990’s. 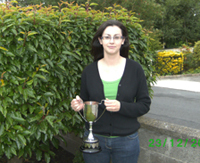 There was also the Cannon Studard, Camilla Hanly and Brian Hanly cups for Juniors. A regular feature of the tennis club when active was the Saturday Junior tournament which was very popular. In addition to all the above there was table tennis played in the club house. In the last 16 years the club went into decline but the site remained in place and was an excellent location to develop the club and bring it into a new era. In 2008 the club was reformed and in 2011 after 3 years of planning 3 full International all weather courts and international standard lights were installed together with a public playground. This is Phase 1 of a multiphase redevelopment of the club.